Macbook pro 15'/240 SSD/ 8 GB RAM. Condition is Used. Shipped with USPS Priority Mail. Good condition Macbook Pro. Works perfect with the exception of the mouse pad. It only works when set to tap setting the push button does not work. Recommend using a seperate wired or wireless mouse . Comes with new battery. In picture is what you get. Apple MacBook White 13" New 250GB HDD 2.26 GHz 4GB RAM LATEST OS 2017 Extras. Condition is Seller refurbished. Shipped with USPS Priority Mail. Disque Dur SSD 256G. Il est doté d’un clavier Qwerty rétro-eclairé. Apple MacBook Pro A1502 13.3" Laptop 2.6GHz i5 8GB DDR3 128GB SS HD. Condition is Used. Shipped with USPS Priority Mail. **no box** comes with original charger I literally only used this to write my thesis, and no longer have use for it. Great shape, no dents, one mark (pictured) from a reagent during my studies - does show scratches on the outer shell bottom and lid (normal use and unavoidable - many are only visible upon close inspection). Completely factory reset and works perfectly. Great shape and a fantastic deal for a lightly used MacBook Pro! Apple MacBook Pro A1286 15.4" Laptop - Mid 2012. Condition is Used. Shipped with USPS Priority Mail. Charger included, no box. For Processor and hard drive details and ram please see pictures, what's posted above on "About this product" is ebay's generic information. Upgraded to a 1 TB upgraded SSD. - Upgraded to 10 GB of RAM. OS X 10.13.6 High Sierra is currently installed on this machine. 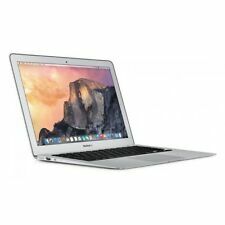 Apple MacBook Air A1465 11.6" Laptop (June, 2012) . Needs a new battery but turns on when connected to AC power. Best for someone willing to refurbish or for parts. Used case included. power supply not included. Shipped with USPS Priority Mail. This stand is made out of matching gray steel, with stainless tilt-adjust knobs. Macintosh PowerBook3,4 (Titanium) G4 - 800 mHz with 512 mb RAM - Stunning Condition! Rare to see a TiBook in such nice condition - clean and unmarred case except for small ding in outer screen case above the Apple logo. For sale is a used MacBook Pro A1278 2.53 gHz 13" 4GB Ram 500GB HD laptop. Neues AngebotApple 2015 MacBook Pro 13"/ 3.1Ghz i7 / 16GB/ 500GB Flash/ Warranty!/ Low Cycle! Condition is Used. This is a used MacBook Pro. i7 16GB/ 500 GB Flash Storage. Low Battery Count (Note photo). No iCloud Lock. This MacBook has no screen cracks or dents. Light scratches from normal wear and tear. 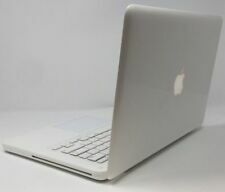 Apple MacBook Air A1465 11.6" Laptop . Condition is Used. Shipped with USPS Priority Mail. Apple MacBook Pro A1278 13.3" Laptop - MC374LL/A (April, 2010)Original drive replaced with 1 Tb Western Digital in 2014Keyboard, Top Case and Display in good conditionSome wear on bottom caseBattery life of 90 minutes, Battery Service Recommended warningCondition is Used. Includes working power adapter, original boxShipped with USPS Priority Mail. MODEL NO: A1181. 80GB HARD DRIVE. APPLE MACBOOK. BLUETOOTH & WiFi ENABLED. MAC OS X LION 10.7.2 & MICROSOFT OFFICE. Refurbished internals.2012 macbook pro 13. Condition is Used. A few dents to the casing. Apple MacBook Pro A1398 15.4" 2.5GHz/16GB/512GB Laptop - MGXC2LL/A (July, 2014), Used in good condition, owned since April 2015. Apple MacBook Pro A1502 13.3" Laptop - MGX72LL/A (2014). Condition is Used. Shipped with UPS Ground. Condition is Used. It's been freshly wiped with Yosemite 10.10.5 installed, so you can set it up at your convenience. 250 GB hard drive with 8 GB of RAM and a 1.3 GHz processor. This Unit does not contain a Hard Drive. This Unit does not have an OS. The Top Left and Right corners of the devices while closed are dented. At CIT Electronics, we are proud of the service and quality of the products we provide. Barely to use, you can check on battery count. Battery count : 11. 500MHz system. 576MB RAM (maximum). 60GB HDD (upgraded, new). PowerBook4,1 | M6497 | M7698LL/A (CD-ROM). This iBook G3 Snow is in excellent condition. It is the first model ever produced (500MHz). Works great. Battery has 526 cycles. No Power adapter. If you want to add external peripherals, dual Thunderbolt 3 ports support bi-directional transfer speeds of up to 40 Gb/s, while also supporting 10 Gb/s USB 3.1 and device charging. It has LED backlighting with a maximum brightness of 500 nits, and it includes support for the P3 wide color gamut. MacBook Pro 2012 1TB SSD macOS Mojave 8Gb RAM core i7 2,9Ghz top of the line 13"
Apple Macbook Pro 2009 13" 2.53GHz Intel Core 2 Duo 4GB 1067 MHz DDR3. Condition is Used. Shipped with USPS Priority Mail. 500GB (For MacOS). This MacBook has had its specification maxed out with the maximum supported 16GB RAM & is fitted with a 500GB SSD Storage Drive. This MacBook supports a wide range of storage options, so if you've a particular storage capacity in mind, we can upgrade this unit to up to 4TB total storage space. Condition is Used. I just used to to browse the net and such. Wife needed a Windows PC for work so no need for this one anymore. I would keep it for another few years if it wasnt for that.